The workshop begins Tuesday, July 6 at 9:30 am. We will meet at Delta Community Music School at 4705 Arthur Drive in Ladner. As usual we have a wide range of students from beginner level high school players through to very advanced players. Students will be assigned ensembles to work with on the first day. Placement may change as we get to know your abilities, needs, and personalities. Our full-time faculty members will rotate among the groups on a daily basis. We expect a high level of courtesy and respect among all participants in the Workshop. We have never had any behaviour problems in the past and we hope to keep it that way again this year. Please be sure you have paid the full workshop fee BEFORE the workshop starts. In the event that you are unable to take care of this before the workshop, bring a cheque for the outstanding fees on the first day. extra reeds, valve oil, patch cables, picks, strings, rosin, staff paper, pencils and eraser. Drummers, bass players, and guitarists are requested to bring their own amplifiers and drum kits wherever possible. This equipment can be left at the workshop for the duration. The main building is locked and alarmed at night. If you don’t have what you need, please contact Jared Burrows immediately (ph. 604-294-3714) so we can arrange to have the gear on hand. We will have 2 drum kits and a few bass and guitar amplifiers available for those who don’t have their own. Delta Community Music School has now moved into McKee House at 4705 Arthur Drive. We will be using this building as our primary facility with 5 classrooms. For noon concerts and some rehearsals we will use the hall at Ladner Community Centre and on Wednesday we will use Kin House. Both of these are just a few meters away from the Music School. We have reached our maximum enrolment this year so we will have 6 full time faculty members plus 2 teaching assistants. Faculty members will rotate among the ensembles throughout the week so that all the students should be able to work with all the faculty members. Our faculty members are superb musicians and experienced teachers. Our teaching assistants are also excellent players and are recent graduates from Bachelor of Music in Jazz Studies programs at Berklee College of Music and Capilano University. 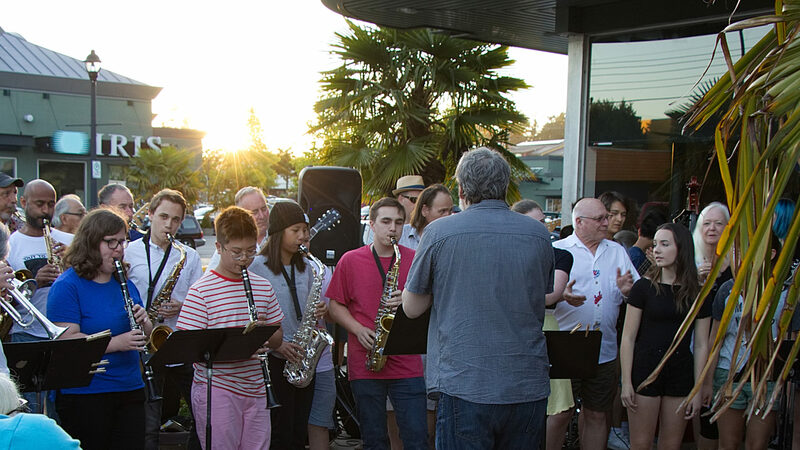 Our advanced students and TAs will be playing at Diefenbaker Park in Tsawwassen on July 6 at 7pm. Come and enjoy an evening in the park listening to music. Thursday July 8 from 7-9pm is our workshop jam session. This is open to workshop participants and to anyone in the community who plays jazz. This is a really fun part of the workshop and something all should plan to attend if possible. Drum kit, keyboard, bass and guitar amps will be provided. Saturday’s schedule will be a little different as the student concert will take place from 12-3pm at the Delta Hospital Grounds. Our final performance will be part of the Delta Hospital Foundation Summer Gala. Parents, spouses, and friends are all welcome to this concert or any of the noon hour shows. Admission to noon shows and final student concert is free. Rehearsals on Saturday will run from 9:30-11 and then we will be heading over to the hospital grounds for our final performance. We will need help transporting students between the Music School and Delta Hospital, so if you can help us drive on that day please let us know. The Len Aruliah Quartet will be performing at All Saints Anglican Church in Ladner (just a few meters away from the Music School) at 7:30pm. Students receive free admission to this event and are expected to attend this concert if possible as part of the learning process. The evening concert is an important and required part of the program for workshop participants. We could use some help promoting this concert. Tell your friends! If you have received scholarship funding to attend the camp you will be notified before the start of the workshop. You will be asked to write a letter thanking our various sponsors. We will provide the mailing address and other information for this letter. We’ll be taking photographs of workshop activities throughout the week. The photos help us promote the workshop in coming years and help us get funding from sponsors and government organizations. If you do not want pictures of yourself or your child used in this way, please let us know.